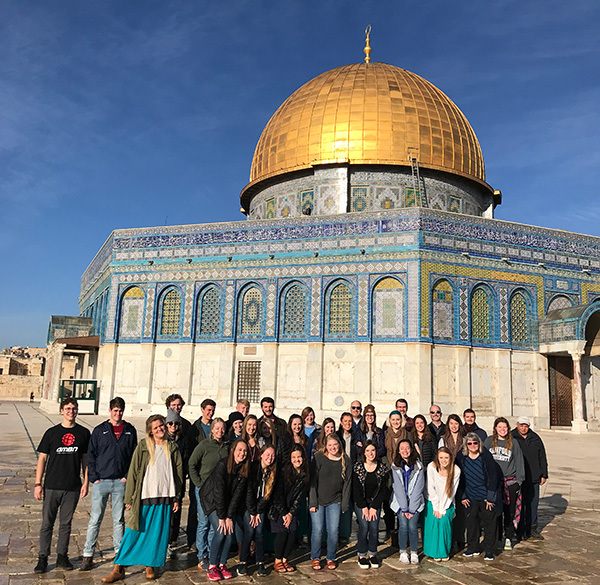 Jeff Leonard’s Israel class visits the Dome of the Rock in Jerusalem. Geography professor Eric Fournier taught a Samford University January Term course "for the seventh or eighth time" in London recently. "I never tire of showing off the city to students, both the big sites and some obscure corners of the city," said Fournier, director of Samford’s Center for Teaching, Learning, and Scholarship. Called Bridging London, Fournier’s course uses a geographic approach to explore the development of historic London and the issues facing the contemporary city. Student Jared Skinner took the course. He said "what is unique about our class is that the city of London was the sole focus of our study. Studying how the city grew and changed while being able to see it before your eyes is a rare and exceptional experience." He added, "Maybe what’s most amazing about London is that most people know it as this historic city of great significance in the past but today it is still in touch with the world. Politically, economically and artistically it remains a powerhouse . . .."
London and the Mediterranean countries of Italy, Greece and Israel were popular destinations for Samford travel courses during January Term 2018. Four travel abroad courses were based at Samford’s London study centre, Daniel House. In addition to Fournier’s class, London offerings included an Arts in Society course taught by School of the Arts faculty, a Travel Writing and Photography class taught by journalism professor David Shipley and a course entitled A Common Language Divided by an Ocean offered by School of Health Professions professors Carol Koch and Karen Thatcher. School of the Arts faculty Joe Cory, Jeannie Krumdieck and Brad Diamond led 26 students on a two-week cultural journey in the British capital. "We are grateful for the opportunity to immerse our students into one of the most vibrant cities for the arts in the world," said Cory. "By exploring everything from street art to priceless Renaissance paintings, Shakespeare to modern opera, and Baroque architecture to the new skyscrapers emerging in the London skyline, all of the students came away with a greater appreciation of the arts and a better understanding of how the arts are intertwined with our everyday experiences." Samford’s sophomore University Fellows travel each January for a study abroad experience entitled "Italy in the Western Intellectual Tradition." They read heavily during their first three semesters in Classical Antiquity, Medieval Christianity and Renaissance and Reformation, noted classics professor Shannon Flynt, "then visit the sites where those great ideas were formed and where they played out in history." As Fellow Mollie Master said, "On this trip, you get to walk where it all really happened." Fellow Jewel Trail called the tour "comprehensive yet in-depth," covering almost two thousand years in time span. Her personal highlight was presenting her report on the Temple of Castor and Pollux in the Roman Forum at the foot of its steps. "After putting in all of the hours on the paper and then the report, finally being in front of the temple was exciting," she said. Classics professors Randy Todd and Andy Montgomery traveled to Greece with a record number of 36 students. They introduced students to the history and culture of the country through first-hand investigations of classical sites ranging from Bronze Age civilizations to New Testament locations. "Our days were typically long with on-site lectures, discussions and explorations followed by lively evenings recapping the day’s investigations," said Montgomery. Student Bailey Bridgeman said one of her favorite moments was climbing the Acropolis and seeing the "perfection" of the Parthenon up close. Student Melanie Hancock’s favorite was visiting the site of Olympia. Religion professor Jeff Leonard led 26 students on a tour of Israel, beginning in the south with visits to the Judean Hill Country and Negev wilderness, then north through the Jordan Valley to the Sea of Galilee, back south by Nazareth to the Mediterranean and ending with a stay in Jerusalem. The students’ most moving moments, said Leonard, seemed to include praying for peace at the Western Wall, confronting the Holocaust at Yad va-shem and visiting the Church of the Holy Sepulcher. A group of theatre, theatre for youth and education students traveled with faculty advisors to Jakarta, Indonesia, to present a series of productions and education lessons in a variety of schools. The program was hosted by a network of Christian schools and universities in Indonesia. The trip resulted from a collaboration between theatre for youth director Laura Byland and education professor Jeanna Westmoreland. Other international travel courses offered during January Term were Development Economics in Rwanda, taught by business professor Jeremy Thornton; Food, Culture and Society in Costa Rica, taught by nutrition and dietetics professor Pat Terry; and Samford in Costa Rica, taught by world languages and cultures professors Joanna Bradley and Andy Milstead.